President Muhammadu Buhari has met behind closed doors, with representatives of Nigerian Governors’ Forum (NGF) over the disagreement between the organised labour and state governors on the proposed N30,000 minimum wage. It will be recalled that the Amal Pepple Tripartite Committee on the Review of National Minimum Wage, had on Nov. 6, submitted its report to President Buhari where it recommended N30,000 as the new national minimum wage. 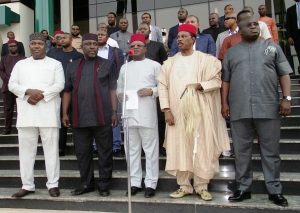 Representatives of the Governors’ forum, who met with the president over the issue, included Governors of Zamfara, Lagos, Kaduna and Enugu, while the Minister of Labour and Employment, Chris Ngige was also in attendance.